1 2 IUPAC, Compendium of Chemical Terminology, 2nd ed. (the "Gold Book") (1997). Online corrected version: (2006–) "configuration (electronic)". 1 2 In formal terms, the quantum numbers n, ℓ and mℓ arise from the fact that the solutions to the time-independent Schrödinger equation for hydrogen-like atoms are based on spherical harmonics. ↑ IUPAC, Compendium of Chemical Terminology, 2nd ed. (the "Gold Book") (1997). Online corrected version: (2006–) "Pauli exclusion principle". ↑ Weisstein, Eric W. (2007). "Electron Orbital". wolfram. ↑ Ebbing, Darrell D.; Gammon, Steven D. (2007-01-12). General Chemistry. p. 284. ISBN 978-0-618-73879-3. ↑ Bohr, Niels (1923). "Über die Anwendung der Quantumtheorie auf den Atombau. I". Zeitschrift für Physik. 13: 117. Bibcode:1923ZPhy...13..117B. doi:10.1007/BF01328209. ↑ Stoner, E.C. (1924). "The distribution of electrons among atomic levels". Philosophical Magazine (6th Ser.). 48 (286): 719–36. doi:10.1080/14786442408634535. ↑ Pauli, Wolfgang (1925). "Über den Einfluss der Geschwindigkeitsabhändigkeit der elektronmasse auf den Zeemaneffekt". Zeitschrift für Physik. 31: 373. Bibcode:1925ZPhy...31..373P. doi:10.1007/BF02980592. English translation from Scerri, Eric R. (1991). 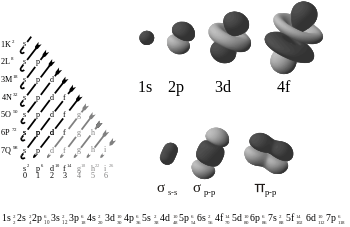 "The Electron Configuration Model, Quantum Mechanics and Reduction" (PDF). Br. J. Phil. Sci. 42 (3): 309–25. doi:10.1093/bjps/42.3.309. 1 2 Madelung, Erwin (1936). Mathematische Hilfsmittel des Physikers. Berlin: Springer. ↑ IUPAC, Compendium of Chemical Terminology, 2nd ed. (the "Gold Book") (1997). Online corrected version: (2006–) "aufbau principle". ↑ Wong, D. Pan (1979). "Theoretical justification of Madelung's rule". Journal of Chemical Education. 56 (11): 714–18. Bibcode:1979JChEd..56..714W. doi:10.1021/ed056p714. ↑ Scerri, Eric R. (1998). "How Good Is the Quantum Mechanical Explanation of the Periodic System?" (PDF). Journal of Chemical Education. 75 (11): 1384–85. Bibcode:1998JChEd..75.1384S. doi:10.1021/ed075p1384. Ostrovsky, V.N. (2005). "On Recent Discussion Concerning Quantum Justification of the Periodic Table of the Elements". Foundations of Chemistry. 7 (3): 235–39. doi:10.1007/s10698-005-2141-y. ↑ Melrose, Melvyn P.; Scerri, Eric R. (1996). "Why the 4s Orbital is Occupied before the 3d". Journal of Chemical Education. 73 (6): 498–503. Bibcode:1996JChEd..73..498M. doi:10.1021/ed073p498. ↑ Meek, Terry L.; Allen, Leland C. (2002). "Configuration irregularities: deviations from the Madelung rule and inversion of orbital energy levels". Chem. Phys. Lett. 362 (5–6): 362–64. Bibcode:2002CPL...362..362M. doi:10.1016/S0009-2614(02)00919-3. ↑ IUPAC, Compendium of Chemical Terminology, 2nd ed. (the "Gold Book") (1997). Online corrected version: (2006–) "relativistic effects". ↑ Pyykkö, Pekka (1988). "Relativistic effects in structural chemistry". Chem. Rev. 88 (3): 563–94. doi:10.1021/cr00085a006. ↑ Miessler, G. L.; Tarr, D. A. (1999). Inorganic Chemistry (2nd ed.). Prentice-Hall. p. 38. ↑ Scerri, Eric R. (2007). The periodic table: its story and its significance. Oxford University Press. pp. 239–240. ISBN 0-19-530573-6. ↑ Hoffman, Darleane C.; Lee, Diana M.; Pershina, Valeria (2006). "Transactinides and the future elements". In Morss; Edelstein, Norman M.; Fuger, Jean. The Chemistry of the Actinide and Transactinide Elements (3rd ed.). Dordrecht, The Netherlands: Springer Science+Business Media. ISBN 1-4020-3555-1.